Call me old fashioned, I am a little scared of the future. This is a sentiment that will hit many of us eventually. What is wrong with the way technology works right now? Do I really need to talk to my speakers or plug myself into the Matrix just to order a pizza? The idea of getting behind the wheel of an automatic car gives me the heebie-jeebies, but just this week laws are being passed to allow cars to limit your speed by pinging up to a satellite. 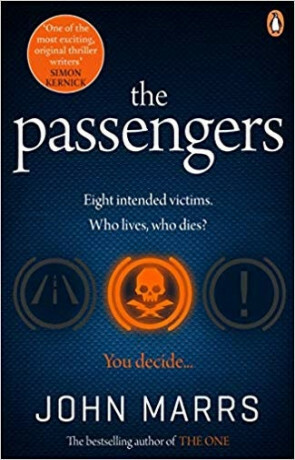 A future in which all cars are automated is not a farfetched one, but if you read John Marrs’ The Passengers, it may be a future you do not want. It is a normal day in near future Birmingham. Commuters across the city are getting into their automated cars on their way to work, but for some, it will be the last trip they make. A shadowy hacker has taken over a number of cars in the city and is driving them to a remote location. The idea is that all the passengers will die in a head on collision with only one survivor. Who decides the victim that lives? We the people. That’s not going to end well, is it? Science Fiction has always been one of the most powerful genres when reflecting modern life. A book may be set thousands of years in the future in far-flung lands, but the story and characters can be undeniably about today. The best are allegories that allow the reader to think for themselves and discover the truth. The worst are a little less subtle than this. Others still hit you over the head with a book called MORALS until you lose consciousness. Passengers is one such book. Marrs poses some moral conundrums and proceeds to use the subtlety and grace of a moose in a china shop. The setup of the book is an interesting one, a near future thriller that feels like it could happen. Do we really trust that an automated car cannot be hacked when thieves are stealing keyless cars from outside people’s house today? The issues lie not with the idea, but the characters and how Marr perceives the wider community in the book. Early on we discover that a social media poll will impact who lives and who dies. Most people are aware that social media is a detached entity and keyboard warriors are not that nice, but Marr paints even these people a little bluntly. We are racists or people who lack the ability to see nuance. I get the point, but it feels at times that Marr is shouting in the readers face saying that as a society we are vile. Marr tars with a wide brush so it is up to the individual characters we meet to create some subtle storytelling, but even here people are blunt. The gross MP is like a cartoon villain you cannot image exists in the real world. The main female character is too wet to root for. Worst is the side character introduced to tell the MP and co about the current social media situation. This character is pure caricature unable to relate to the real world. He is more in keeping with something from The Hunger Games than a book set a mere few years ahead in the UK. The main bulk of the book is taken up with the thriller elements as we witness the passengers’ fates and if you are a fan of airport potboilers, you will get your money’s worth. In places I found the book a little too harrowing and the thrills more upsetting than enjoyable. The book actually improved for me in the post-mortem. Here we find out a little of what happened behind the madness. All of a sudden it is crime territory and the pace slows to a more manageable level. Passengers is set in the near future and although mostly a thriller it still counts as science fiction. Marr’s view of what is to come is depressing, but believable as the world is one like our own, but with some tweaks. The messages of tolerance that underpin the book are worthy, I just am not sure how they were executed worked. A pure science fiction book may have paced proceeding out allowing the reader to discover for themselves what is happening. By going for thrills the book just feels a little shouty. Written on 29th March 2019 by Sam Tyler.